"Be still, and know that I am God! 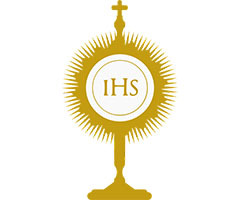 Adoration is the practice of praying before Jesus Christ in the Blessed Sacrament exposed in a monstrance on an altar. Benediction is when the people are given a blessing by making the sign of the cross over them with the monstrance. Adoration and Benediction is held on the first Friday of the month from 6.00 PM to 7.00 PM and at other times as notified in the Parish Newsletter.